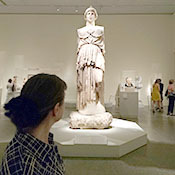 Professor of Classics and Art History, Mary Stieber received her Ph.D. in Classical Archaeology from Princeton University. She has published widely on the interrelationships between Greek art and literature. Her books reflect the range of her scholarly interests: The Poetics of Appearance in the Attic Korai (2004) and Euripides and the Language of Craft (2011). A long-standing passion is Plato (and, of course, Socrates), in particular, his acquaintance with, and use of, the visual arts in the dialogues; she is currently engaged in writing an article on the artist and the Forms in the Republic. Other continuing areas of interest include Homer, Greek tragedy, and, on the Roman side, the Augustan era. The projected title of her latest book-in-progress is Paragone: The Rivalry Among the Arts in Classical Antiquity.